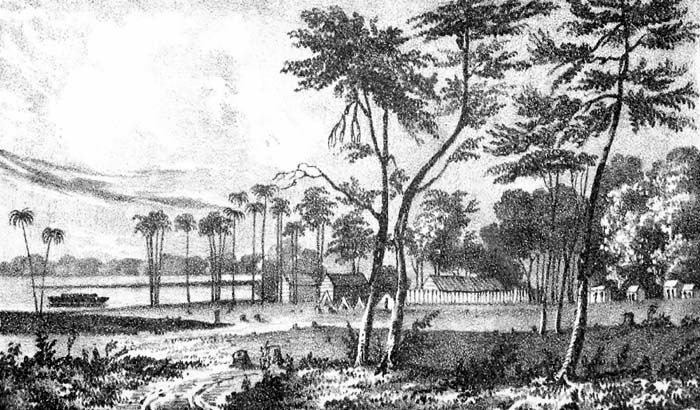 During the Second Seminole War, the U.S. Army established Camp Monroe, Florida as a staging area for unloading troops and supplies in 1836. It was strategically placed on the shore of Lake Monroe which stretches 16 miles and flows into the St. Johns River. The camp was enclosed by pickets on three sides but open to the river. Approximately 300 men were based there and a long pier was built in 1837 for receiving supplies. This became the Mellonville Pier. On February 8, 1837, a force of Seminole Indians led by Emathla (King Phillip) and his son, Coacoochee, attacked the camp, resulting in the “Battle of Camp Monroe.” Captain Charles Mellon was shot dead, and 14 men at the camp were wounded. Three days later, the camp was renamed Fort Mellon in memory of the fallen captain. In March of 1837, a Capitulation Agreement was established between the U.S. Army and the Seminole people. By May of that year, 2,500 Seminole, including Chief Osceola, peacefully camped near the fort under the terms of the agreement. Unfortunately, hostilities did not completely end. Over time, a river port developed as the fort disappeared. Mellonville became the end of the line for all settlers heading to South Florida when steamboat service was established between Mellonville and Jacksonville. Mellonville later became known as Sanford. 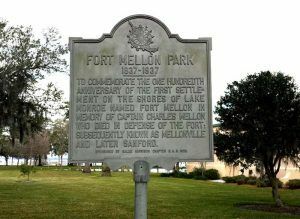 A historic marker is located in Fort Mellon Park at 600 E 1st Streer in Sanford, Florida.